Okay girls, this is a really cute bargain! Incredibly enough this promo set by “Pink Promise” (Owner: Krissy Soup) is only 35 Linden Dollar! 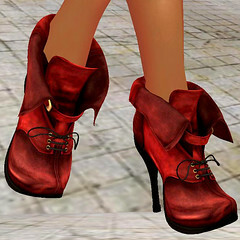 It can be worn by adult as well as children avatars. This is a real promotion bargain for 99 Linden and only at that price for a limited time. “Frozen” is available in several different colours and really is a full outfit by all means. It comes not only with the dress and jacket but also with boots and hat. The bonus edition also contains a two additional striped versions of the outfit.